Alaska Airlines and Virgin America are growing their footprint in the Lone Star State, expanding service to Dallas Love Field from four West Coast airports. With new routes between Love Field and Seattle; San Diego; Portland, Oregon; and San Jose, California, the combined airline will serve eight destinations from Love Field with 18 daily peak season departures, up 40 percent. Just four months into its merger with Virgin America, Alaska Airlines has announced unprecedented growth from the West Coast, adding a record 37 new markets to date. The new Love Field expansion builds on Alaska’s successful service to Texas, which began 12 years ago. After today’s announcement, Alaska Airlines and Virgin America will offer guests 59 peak season flights a day to/from five Texas airports, including Austin, Dallas Fort Worth, Dallas Love Field, Houston and San Antonio. The four new routes will be flown using three-class jets. The Embraer 175 jet, operated by SkyWest Airlines, will fly daily to Portland, San Diego, San Jose and Seattle. One of the two daily flights to Seattle will be operated by Virgin America using an A320 family aircraft. All guests flying the new routes will enjoy Free Chat, free movies, premium food and beverages, Wi-Fi and advance seat selection. In addition to the four new markets, Alaska Airlines and Virgin America are streamlining the airlines’ route network at Love Field, redeploying aircraft to meet consumer demand in existing and new markets. Starting this summer, Virgin America jets will be replaced with a 76-seat E175 jet in two Love Field markets – New York’s LaGuardia Airport and Washington, D.C.’s Reagan National Airport. On Aug. 27, three-times daily service to New York’s LaGuardia Airport will operate using an E175 and increase to four daily flights on Oct. 28. Starting Feb. 18, twice-daily service to Reagan National Airport will also be replaced with an E175. The third daily Love Field-Washington Reagan National daily trip will continue to be operated by Virgin America until March 11, when SkyWest will take over the evening flight. As part of these schedule changes, Virgin America will permanently exit Love Field-Las Vegas on Aug. 26. 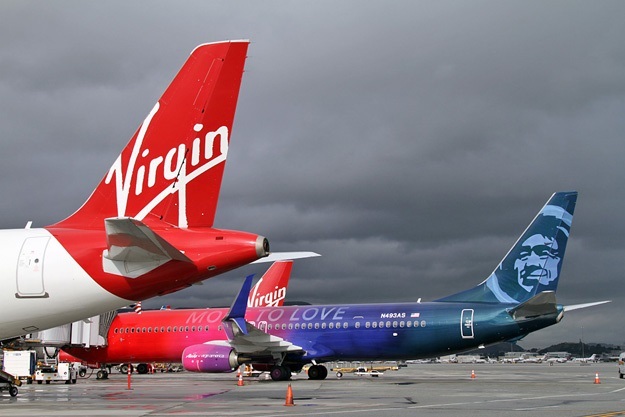 The fleet changes will free up Virgin America planes used in Love Field, to fly new, previously announced long-haul San Francisco flights to Philadelphia, New Orleans, Nashville, Indianapolis, Raleigh-Durham and Kona, as well as new flights between Los Angeles and Philadelphia. Virgin America will continue to operate three daily flights between Love Field and Los Angeles and three daily flights between Love Field and San Francisco. Additionally, all Virgin America employees in Dallas and LaGuardia are keeping their jobs. There is no change in employment status for any teammates as a result of this announcement.